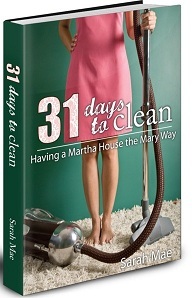 A few years ago I read the ebook, 31 Days to Clean: Having a Martha House the Mary Way. I found it to be an excellent tool in helping me balance cleaning and entertaining/serving others. I tend to be a person who does one or the other. I generally have no issues with keeping my living room, kitchen, and bathroom clean, but find that if I do not have things in perfect order, I panic at the idea of someone stepping into my home. This e-book is available on through Amazon and is only a few dollars. We are due with our 5th baby (one in heaven) next month, in about one month's time, so I will attempt to finish this book as part of my nesting and will chronicle my journey here! I did keep a blog at the last time I did this journey, but I have taken that blog down, so this time I will be starting from scratch again. Join me as I work on balance! We can all use a little more of that, I'm sure!